SALT LAKE CITY, Utah - DigiTech today announced that the new Spring Tank reverb pedal for the iStomp(tm) is now available from the DigiTech Stomp Shop app on iTunes. The Spring Tank pedal provides the rich spring reverb effect found in vintage amplifiers and on numerous classic and contemporary recordings. Not only does the new offering produce a rich stereo spring reverb effect, it also produces the distinctive "boing" artifact unique to spring reverb trays that guitar players have come to know and love. While the Spring Tank reverb pedal delivers the great sound of a traditional spring reverb, it also takes the concept of a spring reverb a step farther. Unlike single knob reverb effects found in guitar amps, the Spring Tank provides four separate knobs to control Reverb level, Boing, Twang and Tone. The pedal has a cool, unusual design, morphing a traditional spring tank into the form of a classic stompbox. 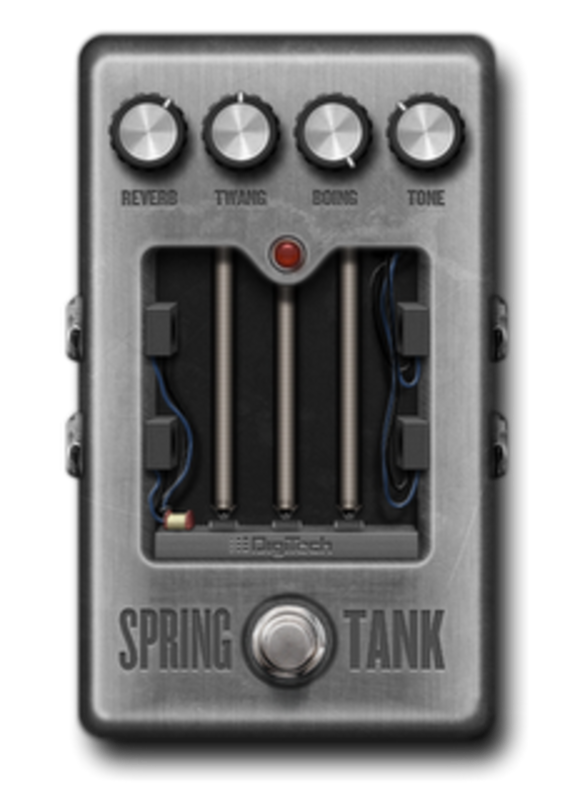 The Spring Tank pedal is the 26th and latest pedal added to the Stomp Shop app for use with the iStomp downloadable pedal. The Stomp Shop debuted in January 2012 with an initial compliment of 22 pedals ranging in price from US$1.99 to US$9.99. Each month DigiTech continues to add new pedals to the pedal line to bring guitar players fresh new options. Using the digital download format of the iStomp allows DigiTech to put many new and unusual pedals into guitar players' hands vey quickly. "This is one of many new pedals to come as we expand the iStomp pedal line. The pedals in the Stomp Shop offer a wide variety of high-quality tones and effects that musicians are looking for. The new Spring Tank pedal is no exception," stated Rob Urry, vice president, HARMAN Professional Division and general manager of Signal Processing and Amplifier Business Units. The Spring Tank pedal is now available for only US$0.99. This special launch price will run through April 30, 2012, after which it will move to its regular price of US$9.99. The DigiTech iStomp is an entirely new concept in guitar stompboxes that allows musicians to turn the iStomp into any pedal in the Stomp Shop. Offering almost limitless sonic possibilities, the iStomp connects to an Apple iOS device where musicians can use the Stomp Shop app to load it with the pedal of their choice. The Stomp Shop is a free app and comes with two of the most popular requested pedals, the DigiTech Total Recall(tm) digital delay and the DigiTech Redline(tm) Overdrive. It also gives access to additional pedals that musicians can browse, try out, and purchase. With the iStomp, DigiTech can deliver an ever expanding variety of great new pedals to guitar players worldwide via the Stomp Shop app.